I thought I was going to see the model of a bottle of the POM that keeps you regular. You guys like to squeeze all that you can out of that poor engine, don't you? I love me some POM. 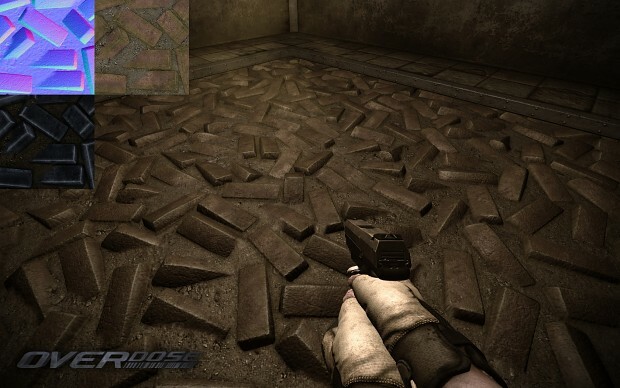 Does it cast and receive shadows too like the pack in Doom 3? Is that a flat surface with just some amazing normal mapping? Bloody hell, big company spends millions on new engines when group of people can make something so perfect on old one. Modders i im not disapoint. It's not just normal mapping, it's also parallax occlusion mapping. Normal mapping puts a shadow on the surface based on the position of the lights & normal map. With parallax mapping, the surface gets duplicated a number of times and are cut off based on a height map. You can see this really well in the picture Gavavva posted in the comment. The side of the bricks look stretched because it are duplicated pixels. Yeah, its just a fancy shader, and you can see a lot of flaws with it when you don't use it correctly. That second pic I posted is chock full of them, but thats because of the settings I was using at the time, which is sorted now. This looks really nice, however it also appears to be the work of a very inept bricklayer! Is that just advanced displacement mapping? Displacement mapping uses actual geo to deform the surface, meaning that you end up with a sub-devisied mesh rather than a flat surface, which while nice, is a) slow and b) creates under certain circumstances odd colision if not handled in the right way. This always remains a simple flat surface, 2 polygons in this case, no matter what. As for the fall back to lower quality options question, yes, we fall back to lower qualitity options like Penumbra, including of course "off". As we always say, everything in OD has various graphical qualaity settings, which means you can run the game in its highest or with everything disabled (To a certain point... Cheating etc comes into play here). Looks awesome. Any plans to implement tesselation? No. We don't consider it to be worth the effort. Amazing quality. How is this hitting performance? Depends on number of samples taken (which vary for each surface material AND viewing angle too). Generally speaking, yes, it's expensive, but it's not that big a deal. In any case, it can be disabled (it is by default). Been in there ages, but yeah, POM lol.